The key to a good dispatch software is organization. Businesses tend not to do well when your team becomes disorganized, your field workers arrive late to jobs, or employees fail to communicate important work order details. Smart Service janitorial service dispatch software makes these worries a thing of the past. Schedule, dispatch, send work order updates, track teams in the field, collect electronic signatures, create on-the-spot estimates, and manage customer information with the best janitorial service dispatch software. Smart Service janitorial service dispatch software is unique in that it pairs with QuickBooks to copy all the data you’ve already entered. Names, addresses, specific instructions, and additional notes you’ve made will all transfer over. There’s no need to worry about losing any information, and better still, this allows you to streamline invoicing and cut out wasted time. Our easy, no-fuss scheduling software makes dispatching a breeze. Smart Service utilizes a click and drag interface that makes it simple to assign a job, and because all aspects of Smart Service are connected, that information is relayed to your field teams without any extra steps. You set a job, and not only do they now know, they have access to that customer’s address, job specifications, notes, routes, and any other pertinent information in your customer file. No need to call anyone and play phone tag, as long as they have their Smart Service mobile app, our janitorial service dispatch software does the leg work for you. 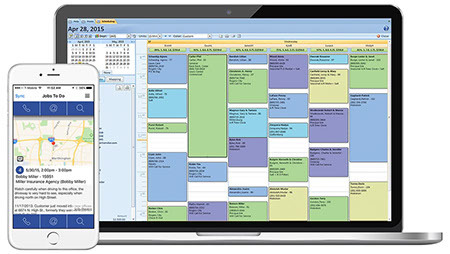 Smart Service janitorial service dispatch software lets your teams view their schedules in real-time, receive directions to jobs, contact customers, complete paperwork, and generate estimates, all from the field and all with their phone or tablet. You can change the job details, address, or notes at any time and our mobile app will show the latest information once it refreshes. No need to call and check on employee progress. From the office you can track your field teams to see where they are on their route. The mobile app allows your teams (both field and office) to optimize their time and refine their focus. Bring the communication between the field, your office, and your customers to a whole new level. Request a free demo of our janitorial service dispatching software today! Check out some of our tips and tricks for building your business!